This is a list of cities and towns in Armenia ordered by population by the National Statistical Service of the Republic of Armenia . 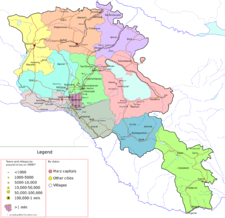 Armenia has 46 municipalities designated as urban communities (Armenian: քաղաքային համայնքներ kaghakayin hamaynkner) as of 2017. However, a city/town (Armenian: քաղաք k'aghak' ) in Armenia is not defined based on the size of its population. The other 457 municipalities in Armenia are considered rural communities (Armenian: գյուղական համայնքներ gyughakan hamaynkner). Yerevan, Gyumri, and Vanadzor are the three largest urban settlements of the republic, currently having populations of more than 80,000. They were considered as "major cities of republican subordination" (Armenian: հանրապետական ենթակայության խոշոր քաղաքներ) during the Soviet period. The rest of the towns have a population of less than 50,000. Agarak, Dastakert and Shamlugh were downgraded from towns to villages as a result of the administrative reforms took place during 2017. As such they are no longer included in the list below. This page was last edited on 22 January 2019, at 13:39 (UTC).